The annual whistle blowing ceremony will announce the official opening of ArtPrize Nine, with live musical performances and a Mayoral Proclamation to follow. GRAND RAPIDS (Michigan) September 19, 2017 — ArtPrize, the independently organized art competition recognized as the world’s largest annual public art event, today announced Opening Day celebration plans for the ninth annual event. The annual Opening Day whistle blowing media moment will take place at 11:45 a.m. on the roof of Lambert Edwards & Associates, ringing in the open of the Public Vote, presented by Meijer. In the evening, Mayor Rosalynn Bliss will join the ArtPrize team, the Grand Valley University Laker Marching Band and Dance Company, the Grand Rapids Symphony and others at Rosa Parks Circle at 7 p.m. to celebrate the opening of the ninth annual event. Everyone is invited to join the Opening Day festivities tomorrow, September 20. Starting at 7 p.m., the Grand Valley State University (GVSU) Laker Marching Band will fill the streets with lively music, starting at the Pew Campus’ L.V. Eberhard Center. 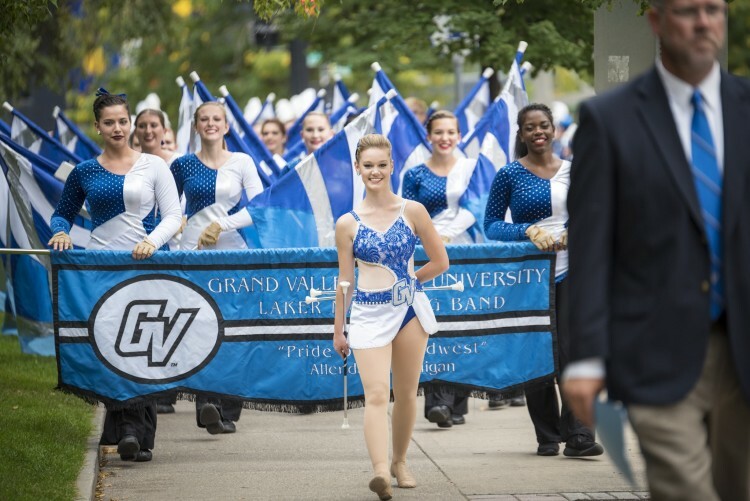 Along with the GVSU Dance Team, the band will move through the streets of downtown Grand Rapids to Rosa Parks Circle, to perform a second time under the direction of GVSU President, Thomas J. Haas. At 7:15 p.m., Todd Herring, ArtPrize Director of Creative and Communications, will take center stage at Rosa Parks Circle for opening remarks, introducing Mayor Rosalynn Bliss who will proclaim the official opening of ArtPrize Nine. The ArtPrize Education Team and Sean Welsh, Executive Vice President of long-time ArtPrize supporter PNC Bank, will return this year to officially launch ArtPrize Education Days. Projected to bring over 18,000 students from across the state, Education Days offers free programs to PreK-12 school groups allowing students to explore their artistic potential. Facilitated by leading cultural institutions, programs range from 30 to 90 minutes and provide educators with a myriad of opportunities to get their classrooms involved. Todd Herring will return to kick off the Rapid Rides to ArtPrize program, returning for a fourth year, which provides 10,000 ArtPrize Metro Passes good for free transportation to and around the 19-day event to community members. Herring will be accompanied by representatives from Blue Cross Blue Shield of Michigan, including Cle Jackson, Senior Community Liaison; Kelley Root, Director of West Michigan Regional Sales; and Jeff Connolly, Senior Vice President and President of West Michigan and Upper Peninsula. Following Herring’s remarks, attendees will experience epic fanfares that bring inspiration to patriotic anthems and gravitas to cinematic scores with the brass sections of the Grand Rapids Symphony. The program will honor 9/11 first responders with selections from Aaron Copland's epic Fanfare for the Common Man, the Heroic Man and John Williams’ Hymn to the Fallen from Saving Private Ryan. The program will also include selections from Harry Potter and Game of Thrones. Following the Grand Rapids Symphony's performance, WGVU Public Media representatives — including Timothy Eernisse, Director of Development and Marketing; Thomas Crockett, Vice President of Station Relations at PBS; and Dubbie Buckler, National Security and Executive Director of American Legion Auxiliary, will address “Landing Zone” Michigan — a program that focuses on remembering, honoring and celebrating veterans and their families within the community. Additionally, they will welcome The Wall That Heals, a life sized replica of the Vietnam Veterans Memorial, to Grand Rapids as well as announce the inaugural Veterans’ Award — an independently organized prize presented by LZ Michigan, The Stow Company and WGVU Public Media. Concluding the Opening Day festivities will be a riveting performance by Marine veteran, DJ Squake, with a powerhouse mix of drum and bass, hip-hop, reggae and house beat tunes. Round 1 Voting kicks off on Opening Day, which will be symbolized by a ribbon cutting-style ceremony earlier in the day. Hosted by Lambert, Edwards & Associates, members of the media are invited to the rooftop of their office at 47 Commerce Ave SW on September 20 at 11:40 a.m EST for a media moment where Jeff Lambert, President of Lambert, Edwards & Associates, and ArtPrize leadership — joined by a small ArtPrize delegation — will commemorate the occasion before a resounding steam-powered train whistle sounds at Noon for the entire city to hear. The ribbon cutting ceremony has been an ArtPrize tradition since the whistle, a hand built replica of a Southern Railroad chime train, was commissioned by Lambert, Edwards & Associates and installed on their rooftop patio in 2012. This steam operated whistle, which boasts a two mile sound radius, was Lambert, Edwards & Associates’ ArtPrize 2012 entry – “WhistLEA” celebrated the end of work and the beginning of play. During the 2012 ArtPrize event, the whistle blew every day at 5 p.m.
“We are surrounded by art and creativity every day — we speak it, write it, watch it and wear it — but often fail to appreciate its impact. ArtPrize has created a platform to change that mindset and makes art accessible to everyone to enjoy, discuss and openly engage with each piece. LE&A has been privileged to participate as a venue and artist every year since ArtPrize’s inception, and it’s an honor to host the opening ceremony for the most notable event in our region,” said Jeff Lambert, CEO of Lambert, Edwards & Associates. The whistle will ring in the opening of Round 1 Voting for the ninth annual ArtPrize event, which will determine the entries selected for the Public Vote Final 20. Five entries in each of four categories — 2D, 3D, Time-Based, and Installation — will continue on to Round 2 Voting, to be combined with the category jurors’ top 20 picks to form a pool of up to 40 finalists. Half of the $500,000 in awards will be decided by public vote, and half by expert jury. ArtPrize 2016 visitors cast 380,119 votes via the free ArtPrize mobile app, at artprize.org, and via SMS text message. ArtPrize Nine will return to Grand Rapids September 20 to October 8. Round 1 Voting will run from Noon on September 20 through 11:59 p.m. EDT September 30, leading up to Final 20 Announcement on October 1 at 1 p.m. EDT in Rosa Parks Circle. For more information, visit artprize.org/events. ArtPrize is an international art competition, open to any artist and decided by public vote. It invites artists to try out new ideas on a large and diverse population of people. It seeks to broaden the critical dialogue around contemporary art by awarding the world’s largest art prize. Two $200,000 awards are decided by public vote and expert jury, and an additional $100,000 in prizes is awarded to the top entries in each category. Registered artists and venues connect online at artprize.org and agree to present the artwork for public display during the 19-day event. The public votes using mobile devices and the web to distribute their awards, while a group of international art experts determines the winners of the juried awards. ArtPrize Nine will include 1,356 entries representing 47 countries and 41 U.S. states and territories. ArtPrize annually attracts more than 500,000 active participants. Since its inception, individuals of all backgrounds have cast more than 3.2 million votes for public art. ArtPrize is made possible in part through the generous support of many organizations. The Corporate Leadership sponsors include Amway, DTE Energy Foundation, Founders Brewing Company, Kendall College of Art and Design of Ferris State University, Meijer, PNC Bank, Switch, West Michigan Honda Dealers, and X-Rite Pantone. Premier sponsors include Consumers Energy; CWD Real Estate Investment; Haworth; Herman Miller Cares; ITC, Your Energy Superhighway; LIFEWTR; Michigan Lottery; Steelcase; and Wolverine Worldwide. Leading Foundation Supporters include the Richard and Helen DeVos Foundation, the Daniel and Pamella DeVos Foundation, the Douglas and Maria DeVos Foundation, CDV5 Foundation, the Efroymson Family Fund, the Frey Foundation, Knight Foundation, Peter C. and Emajean Cook Foundation, The Wege Foundation, the National Endowment for the Arts and the Michigan Council for Arts and Cultural Affairs.